Right now, the only reason you’re likely to remove your steering wheel from your car and carry it around with you is grievous error, but in the self-driving future it could be a very different story. 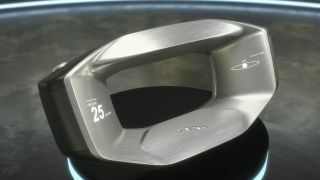 Jaguar has unveiled a concept steering wheel called Sayer, designed for a future where cars drive themselves and personal car ownership is dwindling. The wheel – which isn’t a circle just so you’re extra clear that this is a futuristic concept – would have an AI system and be carried with you as you move from car to car. The AI would act as a personal assistant and would be able to connect you to an online service where you’d be able to get a car as and when you need one. All you’d have to do when you get into a new self-driving vehicle would be clip this personal steering wheel onto the dashboard and use it like a personal assistant. If you had somewhere to be by a specific time, for example, you’d just have to let the wheel know and it would figure out when a car needs to arrive and call you one, or tell you when you need to hop in your own car and get going. The wheel will apparently be a significant feature on an upcoming Jaguar concept car called Future-Type but whether or not it’ll ever actually go into production is another matter. The concept of the wheel is based on unproven guesses about the direction in which driverless technology will go and how we might use it. If we do indeed get rid of the steering wheel, the assistant and display functions of this concept could probably be replicated by our phones which are more portable and with us at all times. That said, getting into a car without a steering wheel would be alarming in the early stages of transitioning to completely autonomous cars. Having an AI system that looks like a cross between a steering wheel and a computer screen could be a good way of easing people into the new technology by offering something safe and vaguely familiar. It might be easier to hand control of a vehicle over to a sturdy AI-powered steering wheel than to the fragile device you dropped down the toilet and smashed only five days previously. We are, however, struggling to see an AI steering wheel become the next big tech accessory everyone's carrying around.